Lumatek has fast become a leading manufacturer of ballasts, lamps and accessories. Now a global name, Lumatek products are innovative and designed to the highest standard. All the products produced are super efficient, powerful and ensure excellent performance. 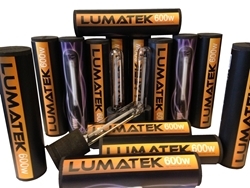 Lumatek is now considered a powerful name for supplying ballasts to hydroponics and horticulture industries, which is why we stock their products to ensure we give our customers the best! These dual spectrum bulbs are the perfect complement for a digital ballast.